Ethiopia's Kenenisa Bekele saw off double world and Olympic champion Mo Farah's late surge to win the Great North Run in a thrilling sprint finish. Farah chased down Bekele in the final 400m to set up a nail-biting finale but the Briton had to settle for second. 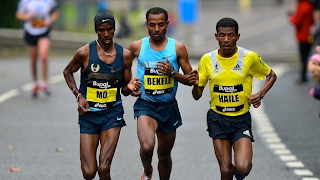 Another Ethiopian, Haile Gerselassie, was a distant third after falling behind in the last of the 13.1 miles. Kenya's Priscah Jeptoo came close to breaking the course record as she ran magnificently to win the women's race. Jeptoo, this year's London marathon winner and the reigning Olympic marathon silver medallist, clocked a time only nine seconds slower than the 65 minutes 40 seconds which was recorded 10 years ago by Britain's Paula Radcliffe. Defending champion Meseret Defar broke the Ethiopian record as she crossed the line behind Jeptoo but ahead of compatriot Tirunesh Dibaba, the reigning world and Olympic champion over 5,000m. David Weir, who was inaugurated into the Great North Run Hall of Fame this week, won the men's wheelchair race for a fifth time.